Spaghetti alla Carbonara and Fettuccine Alfredo are my two favorite pasta dishes. Little did I realize that if I took the best of each one, I’d have something that would just blow me (and my family) away. 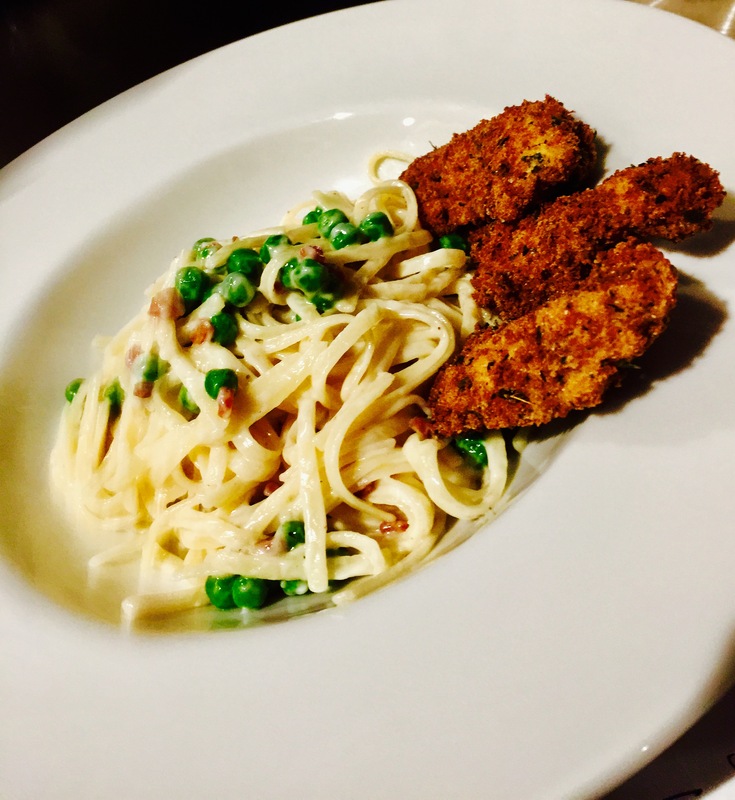 The addition of chicken and peas made for a more balanced plate. This will now be my go-to dish when guests arrive, since many parts can be prepared ahead of time. And you’d never know that this dish is completely gluten-free! The breading for the chicken uses gluten-free bread that I’ve toasted, crumbled and put into a food processor to make breadcrumbs. You get a lot more flavor this way than using store-bought GF breadcrumbs from a can. I add gluten-free flour to it to lighten it up. Cup4Cup is by far the best GF flour I’ve tried. Scramble the egg in a bowl. Cut the chicken into pieces, and add them to the egg, making sure they get evenly coated. Set aside. In another bowl, combine the bread crumbs, flour, parsley, oregano, basil, garlic, onion, salt and pepper. Set aside. Fill a pan with about an inch of olive oil. Heat to medium-high, for frying. Many recipes for Spaghetti alla Carbonara use pancetta or bacon. But the original recipe calls for guanciale: cured (but not smoked) pig jowls, or cheeks. It’s easy enough to find in a good Italian food store, but I cure my own. I buy raw heritage Berkshire pork jowls from a farm that raises the pigs humanely, and cure the jowls for about 3 weeks in a combination of salt, pepper and fresh thyme leaves. Then I rinse them, pat them dry, and cut them into portion-sized pieces, which I wrap individually and freeze until I need them. It’s a lot of work, but to me, totally worth it. 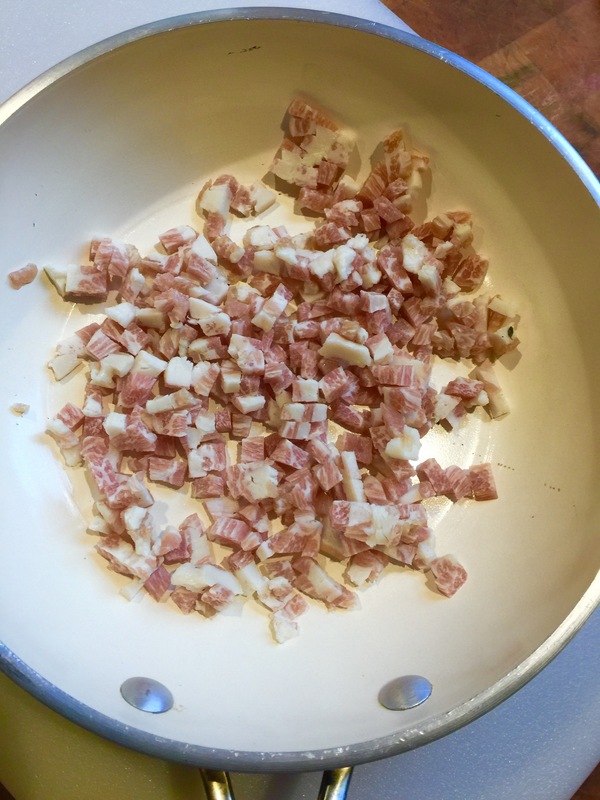 If the guanciale is frozen, let it thaw just a little, then cut it into the smallest cubes you can manage. Place it in a pan and cook them until they’ve browned and crisped beautifully. Keep an eye on the pan, as guanciale can burn easily. 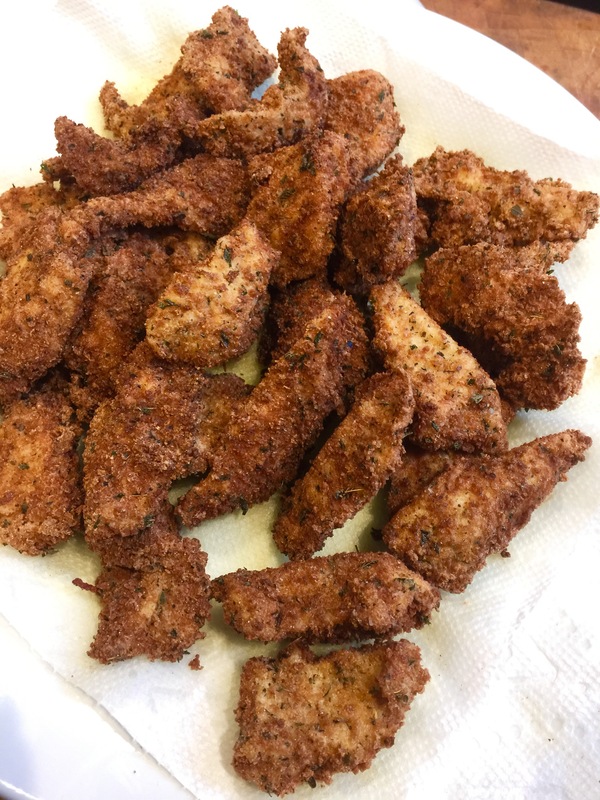 Use the fried meat bits for this recipe and save the fat for flavoring a future dish! Set aside. Despite what you get in crappy restaurants like Olive Garden, Alfredo sauce should not be runny or soupy. It should cling to the pasta and be rich in flavor. I use Garofalo gluten-free pasta exclusively, because it tastes just like real pasta. Believe me, I’ve tried every GF pasta out there. I buy mass quantities at Amazon. Put 2/3 of the cream and all the butter in a large saucepan that will later accommodate all the pasta. Simmer over medium heat for less than a minute, until the butter and cream have thickened a bit. Turn off the heat. Drop the pasta in a bowl of boiling salted water. If the pasta is fresh, it will take just seconds. If it’s dry, it will take a few minutes. Gluten-free pasta, which is what I use, takes a little longer. Either way, you want to cook the pasta even firmer than al dente, because it will finish cooking in the pan with the butter and cream. Drain the pasta immediately when it reaches that firm stage, and transfer it to the pan with the butter and cream, tossing the pasta gently for a few seconds to coat. Turn the heat under the saucepan on low, tossing the pasta, coating it with the sauce. Add the rest of the cream, all the Parmigiano Reggiano, a bit of pepper (no salt because the guanciale will add more saltiness later), and the nutmeg (if you’re using it.) Toss briefly until the sauce has thickened and the pasta is well-coated. …tossing gently to warm them through. Also add the cooked guanciale at this time. Plate the pasta in a bowl or dish and serve the chicken alongside.